Conservative Graham Marsh and Lincolnshire Independent Sarah Devereux were elected to East Lindsey District Council for Alford with 1,057 votes and 775 respectively. They defeated Labour’s Paul Hopwood and Sharon Wilkinson with 628 and 356 votes, Tory Colin Matthews with 652 votes and Green Andrew Hill with 284. Meanwhile Conservative Wendy Bowkett was elected with 447 in Wainfleet, defeating UKIP’s James Edwards, Labour’s Robert Cauldwell and Chris Pain. 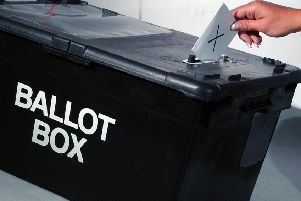 UKIP swept the board in Winthorpe, Daniel Brookes and Susan Blackburn elected with 990 and 922 votes respectively. They defeated Tory Carl Macey with 786 votes, Green Philip Gaskell, 345 and Independence from Europe’s Neil Woods. And the last results of a very long day of counts saw Conservatives Paul Hibbert-Graves and Mel Turton-Leivers take Chapel St Leonards’ seats and UKIP’s Mark Dannatt win the Skegness St Clements seat with 704 votes followed by Conservative Sid Dennis with 573 votes.